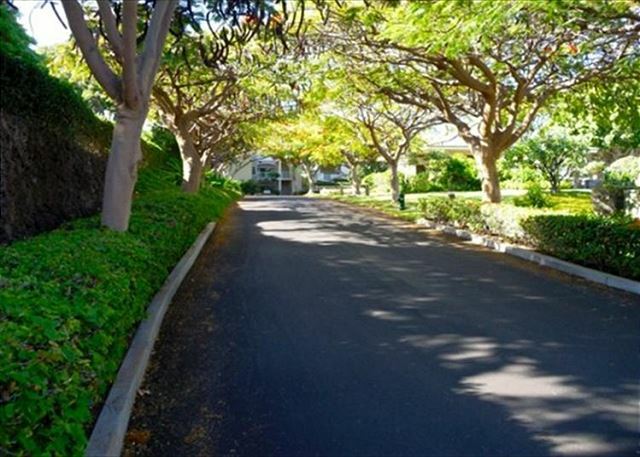 This friendly condo will draw you in with its vast, unobstructed views of the Waikoloa Beach Golf Course complete with Kings' Pond and back side of the Kings' Shops, and a stunning Mauna Kea backdrop. The layout is comfortable and roomy with its attractive tile flooring and wide windows bringing in tons of light. Enhanced by the unit's neutral tones and soothing decor, the brand-new living room furnishings will have you basking in luxurious contentment. In addition to the standard vaulted ceiling and sliding paneled doors found at this complex, this condo is equipped with unique built-in features such as a deep Jacuzzi bathtub and tiled seating in the master bathroom; and extra shelving in the closets. Both bedrooms are carpeted. 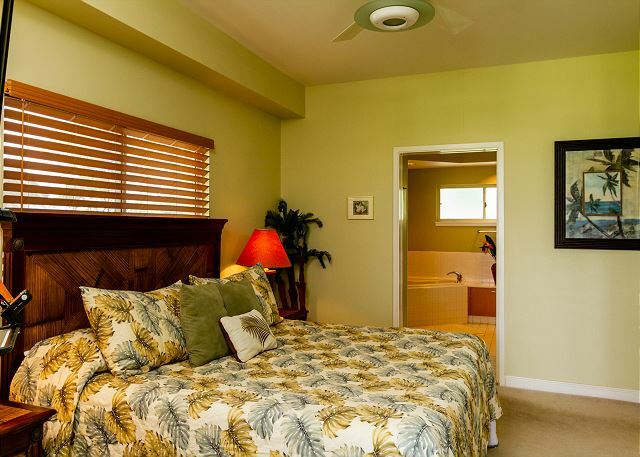 There is private lanai access from the master bedroom along with exquisite views to wake up to each day. Kitchen appliances, including a larger-size refrigerator, were recently updated to ensure hassle-free cooking, and you will find what you need and more among the ample kitchen supplies. The location of this unit cannot be beat. The building is within steps of a large, well-equipped fitness room and a business center. Less than half a block away is a casual restaurant and lounge. And the Kings' Shops, Waikoloa Beach Marriott and A-Bay beach are all within a short (10- to 15-minute), scenic jaunt for access to a variety of shops and restaurants. There is an assigned parking stall right in front of the building and the building has an elevator. Plenty of beach supplies (chairs, boogie boards, umbrellas) are available within the unit or by request. Our families 12 night stay was incredible. 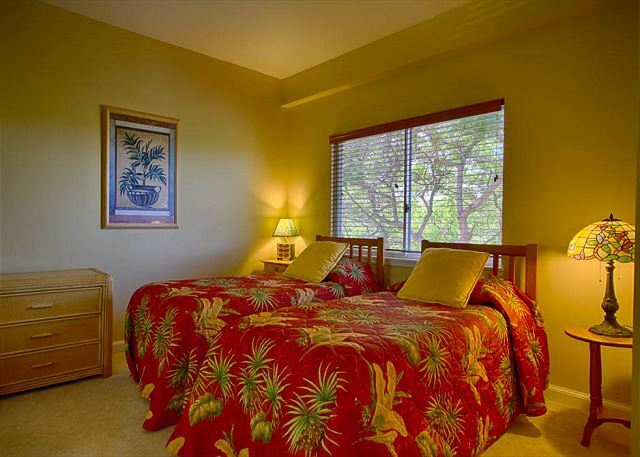 The view is spectacular, Waikoloa is beautifully developed and the condo was comfortable. Great stay during March 2019 for a family of 4. The condo is very spacious, had all amenities that we needed, and was very clean. The arrival and checkout process was easy. Peggy from Waikoloa Realty responded very quickly to any questions or requests we had. We will definitely use Waikoloa Realty every time that we come to the Big Island!! Thank you for a very stress free lodging process. Thank you so much for your nice comments. We are glad to hear that this unit served your needs well. Hope the kids had a nice time also. We look forward to hearing from you next year. The proximity to the Queen and King shops and the Marriott beach was wonderful...just a short walk or a shorter drive. 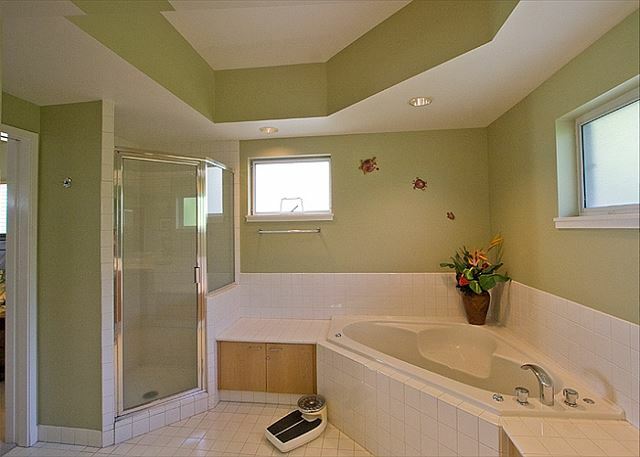 The large master bath and the sweeping views from the welll-appointed living room were very much appreciated. The house was large, well furnished, and had great views. Kitchen was adequately stocked, had necessary equipment, and was good enough for our family. We stayed in G 306 for the 4th time. The condo is clean and well equipped. 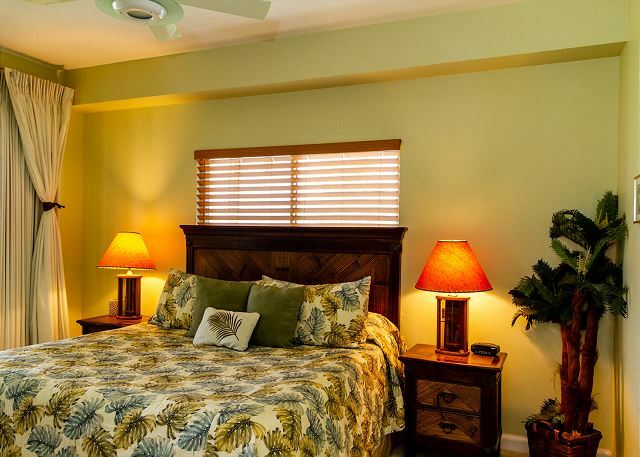 We like the big lanai and the view over the golf course and to the mountains.The property is very well maintained and it has an exceptunally nice pool. 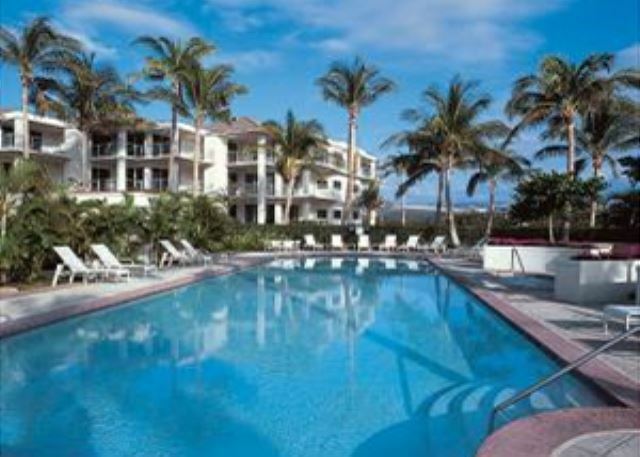 A - Bay is in walking distance as well are shoppings and restaurants. Peggy was always helpful. Property management company is great to deal with. Unit gets an overall rating of 4 it does need a few up grades, but it's a great unit in an excellent location for the price. Have stayed three times in this unit and absolutely love it. Every morning is spent watching the sun come over the mountain and in the evening, you can catch the sun set from just outside the front door. Location is excellent. We had another wonderful stay there at Vista Waikoloa in room G306. The room can have some improvements for sure, but why stay in your room when your in this fabulous place. We have absolutely referred Peggy to our friends. She has taken care of us and all of our friends too. If there is a problem, Peggy is on it in a second! We are so grateful to her and she makes our trip the best it can be! We very much appreciate your nice comments and your continued business. The owners of G306 are outstanding and have made a number of major improvements to improve guests' comfort, and will continue to make more. We look forward to having you back! We are returning guests and very much like the condo and quiet location. Great salt water pool, never too crowded. It is a friendly complex and easy to meet and talk with other guests. This year some reconstruction noise was annoying at times . My wife and I spent 8 wonderful nights here for our first anniversary. The unit is very nice with lots of space, and even fit 4 more family members on our last night between the second bedroom and comfortable living room. The location is really nice, right between Kailua-Kona and Kawaihe and just a couple minutes drive to a great beach at A-Bay. Wish we lived there! The apartment was lovely and really large - there were only two of us and it could have accommodated 2 families easily. Well stocked with everything you could need in the kitchen, and although there were a few bugs crawling around here and there, I think that's pretty hard to avoid in the tropics. Overall it was nice and clean. Great appliances, loved the ice maker in the fridge, and we really appreciated the little welcome package of coffee to get us started! Bed was comfy, lots of room in the closet, and sunny patio was ideal for quiet breakfasts. We made great use of the library of books and travel guides they had available also. The condo had a cooler but it was enormous and broken so Peggy dropped off a couple smaller ones which were great for packing water and freezer packs for after hiking refreshers. The only issue we had was the A/C which wasn't working for the first 2 days. We let Peggy know and she had people come to fix it the first day, thought they had it fixed, but it persisted for two days of pretty extreme heat. Peggy really did try so we weren't too tough about it but a small discount would have been appreciated as we really couldn't sleep those first two nights - so hot in there! One final thing to mention is that a map to the parking spot would have been helpful as trying to find it that first night in the dark was difficult. Everything else was great though - highly recommended. My family vacation at the Vista G306 was so fun. 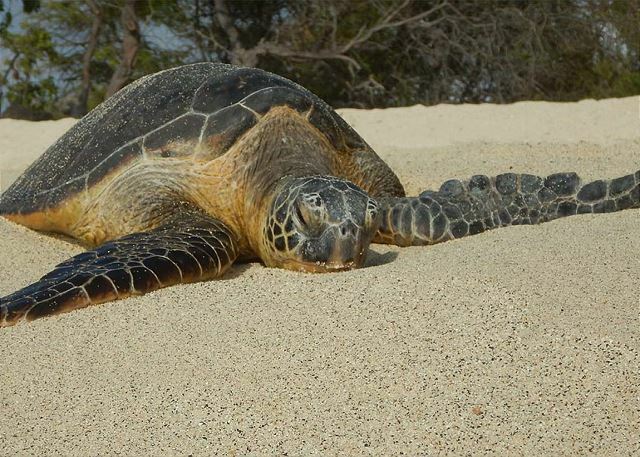 The location of the resort is great for activities all over the island. We spent hours with the young children playing in tide pools a short walk from the condo. The amenities were great and we enjoyed BBQ lunches and dinners in the family friendly dining area. The unit had lots of dishes, pits and pans for preparing hawaii's wonderful fresh foods. Would recommend to other travellers. We have stayed in this unit for 4 months as we look for a home in this area. We would continue to stay but the owners are coming to do some upgrades. Management has measured for a new stove top and refrigerator and tile in the dining area. The unit is perfectly fine, all appliances work, the beds are very comfortable. It is nothing fancy, if you wasn't five star don't come here. 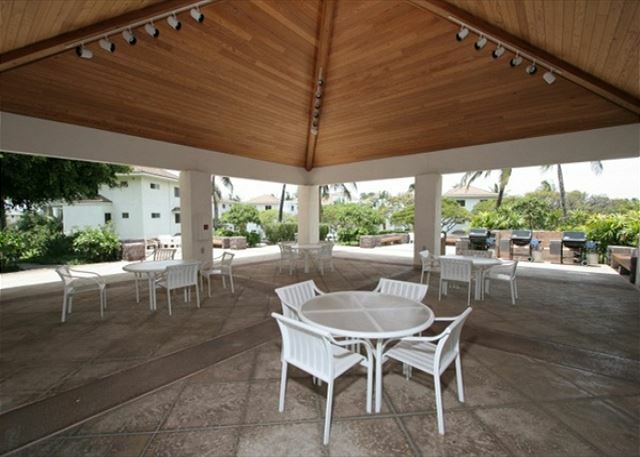 But if you just want a nice place to eat and sleep while you enjoy outdoor time in Hawaii, then this is the place for you. We found the unit neat and clean. The carpets had just been shampooed, there are some stains in dining room. The location is great, you can walk to the King and Queen Shops and the beach if you want. The building is equipped with an elevator so you don't have to use the stairs if you don't want to. It is expensive to dine out here, so plan your menus and cook your meals in house. The Tropics Ale house has Happy Hour $2 sliders and $8 cheese or pepperoni pizzas which is a bargain. Three Fat Pigs has a $16 hamburger that is really good for lunch. The KTA Grocery Store in Waikoloa Village is pretty good. If you have a Costco card there's a Costco right past the airport and Walmart, Target and Safeway in Kona.